When it comes to advanced tooth replacement options, dental implant therapy with our Bulimba family dentist should be at the top of your list. Our comprehensive implant treatments are designed to resemble the natural form and function of real teeth, allowing us to replace your missing ones in a predictable manner. We partner with a visiting Prosthodontist to provide everything from surgical implant placement to custom crown, bridge and denture restoration without referring you to a specialty clinic. Everything is completed here in our office. Having dental implants installed is relatively simple. After the titanium root is placed into your jaw, we wait about four months to allow new bone to grow and fuse with it. After osseointegration takes place, we can attach your fixed crown, bridge or denture. Sometimes it’s possible to install a dental implant on the same day that a problematic tooth is removed. When that’s the case, we’ll cover the implant with a temporary crown as the area heals. The permanent crown is attached about 3-4 months later. Can Implants Support Your Dentures? Yes! Implant supported overdentures are a comfortable and stable alternative to conventional “plates”. Lower dentures can be secured with as little as two implants and upper dentures with only four. Instead of relying on adhesives or pastes to keep your denture in place, implants provide a more secure alternative. Prefer not to wear a removable prosthesis? A permanent implant denture could be the perfect choice. Each of our implant overdentures is designed by hand in our on-site lab. This allows us to create a design that looks and feels as close to real teeth as possible. Many people mistake them as such! 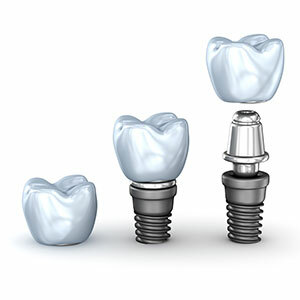 A common misconception about dental implants is that you need a titanium root for each tooth that is missing. Not so. Because implants are so strong, we can use them in pairs to support fixed bridges. This means fewer implants, even if you’re missing all of your teeth. Smile with confidence again. Ask if dental implants are the best choice for your missing tooth needs. Our office is open late, book your consultation today!